Growing up poor and in a family where no one graduated high school instilled in Sergio Lescano a determination to improve his life through education. Lescano has achieved that goal thanks in part to Missouri State University. 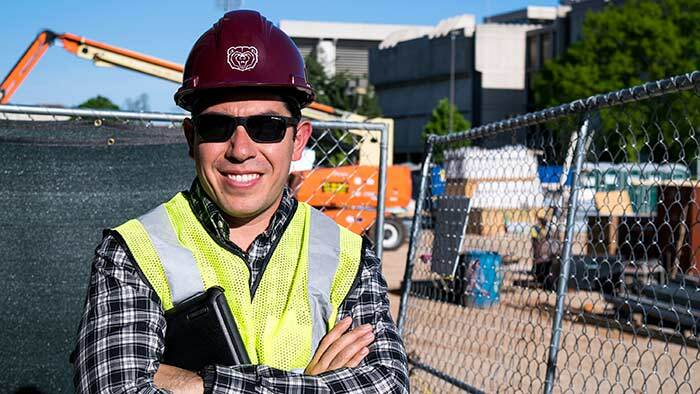 An Argentinian native, Lescano, a graduate student in project management, moved to the U.S. in 2011 to pursue a bachelor’s degree in construction management at MSU. By participating in the Construction Club and networking, Lescano secured a paid internship with Killian Construction Company in May 2015. He got to work on the Cox Medical Center South Tower expansion, where he performed tasks, such as ensuring specific floors were ready for inspections, preparing close-out documents and estimating. His work ethic paid off and Killian rewarded him with a part-time job, which he held throughout his junior year. When he completed his bachelor’s degree last year, the company hired him as a project engineer. What excites Lescano about his field of work is that it allows him to impact people’s lives. Besides focusing on advancing his career, Lescano said he is committed to helping the community by continuing his volunteer work with Operation Christmas Child and Habitat for Humanity, and getting involved with mentoring students. Each semester, the Alpha Sigma Lambda National Honor Society awards a scholarship to an exemplary nontraditional student.